There are lists and lists of movies that have been created from a novel. You can probably think of a handful right now. 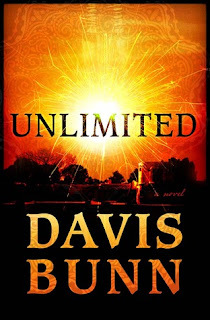 Unlimited by Davis Bunn is working the opposite, a novel taken from a movie! Davis Bunn met with the crew and film director of Unlimited and was able to get insights into the back-story of the characters in the film. Through families involved with the film, the orphanage in Juarez and pastors, Davis Bunn was able to thouroughly share the film experience in book form. Much more wording and expressions are needed in a book, all feelings and details of the visual need explained. Much harder to capture everything around you in a novel I think. He has done an excellent job! Simon Orwell is a former MIT student en route to see Professor Vasquez about a secret project they have been working on to help make electricity more affordable for the people in Mexico. It would create unlimited energy and is cutting edge technology. When Simon arrives he finds Vasquez has died, but something is fishy about it because he died two weeks ago, yet Simon had just received an email from him. Simon just wants to get out of dodge and upon leaving, his car is forced off the road and goes up in a ball of flame. Simon narrowly escapes, with a hunter on his tail. Pedro takes Simon to a near by orphanage to keep him safe while he heals from a gun shot would. There Simon meets Harold Finch who asks him to continue to work on the project, despite the threats that are after him. The book is very fast paced and riveting! Harold is a kind and gentle character with a vast amount of knowledge to share with Simon. I thought the scene of the orphanage was wonderful, and the descriptions of the area around were great. "Simon Orwell is a brilliant student whose life has taken a series of wrong turns. At the point of giving up on his dreams, he gets a call from an old professor who has discovered a breakthrough in a device that would create unlimited energy, and he needs Simon's help. With Harold's help, Simon sets out on a quest to uncover who killed the professor and why. In due time, he will discover secrets to both the world changing device and his own unlimited potential."